The past 22yrs have seen the Rotary Club of Grantham, England hold a highly successful “RotarySwimarathon” raising over £500,000 for local charities and deserving causes. In 2012 (apart from the usual event 3/4/5 Feb) they are holding an extra event – this will be in the form of a Rotary Global Swimarathon – setting a new World Record (presently 2533) for the most number of people swimming at the same time anywhere in the world and raising funds towards Rotary Internationals worldwide project to eradicate Polio. To qualify for the World Record attempt each swimmer will have to swim just 100metres without stopping within the hour. What do you need to know if you would like to participate and attempt the World Record for most simultaneous swimmers & fundraise for “End Polio Now”? 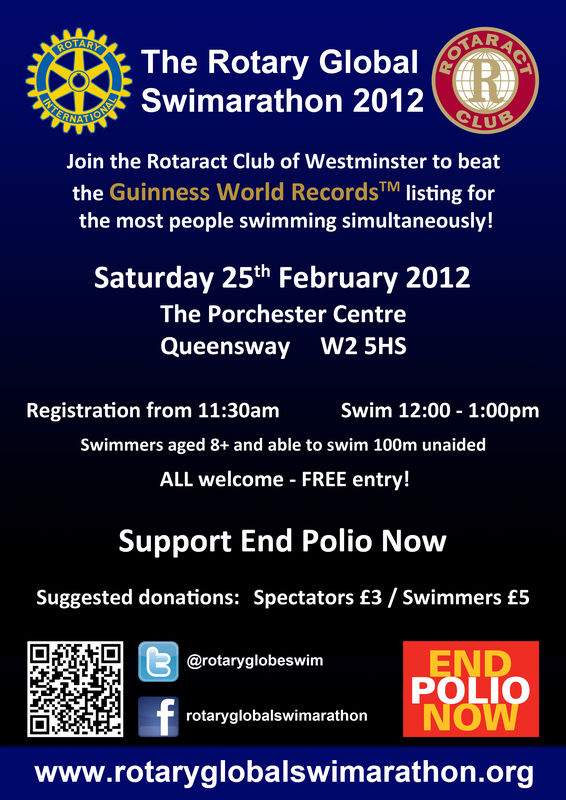 Anyone can join the Rotary Swimarathon (& World Record Attempt).